One of the easiest ways to understand dreams is to see your dreams as a story. Learning to “read” your dreams the same way you read books can provide a lot of insight into what the dream might be about. If you paid attention in literature classes in school, you are probably already very familiar with the different parts of a story. There is a plot, a setting, and characters. Through the events of the story, you are able to identify central themes and lessons. Your dreams are exactly the same way. Each and every night it is like watching a movie or a play of a very interesting and sometimes unpredictable story. These stories are important, and can help us better understand ourselves. ￼After you write down and record your dreams, read it back to yourself as if you were reading a story. 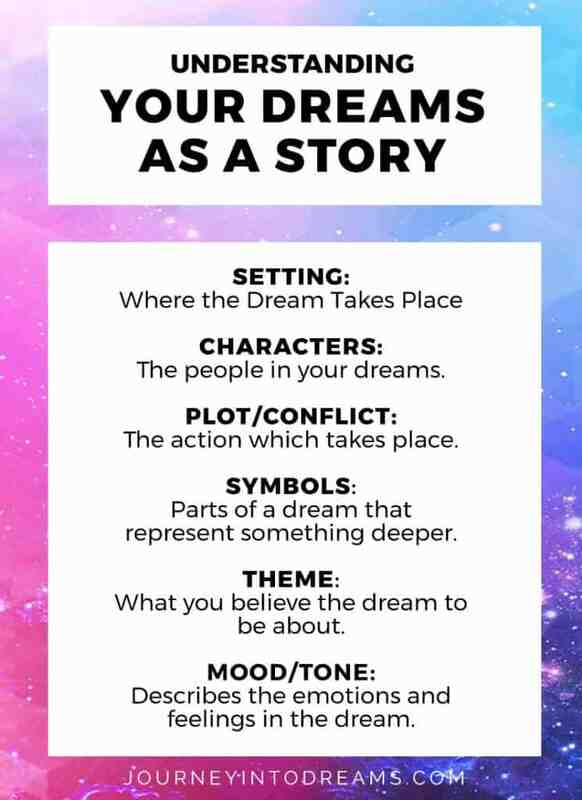 There are 6 main key elements that make up part of the story your dream tells. Being able to identify these elements will make it easier for you to interpret the dream. ￼Setting: This is where the dream takes place. You may have one setting or several settings based on the dream. Characters: The people in your dreams. People in our dreams can represent many things, so be sure to take notice of how they interact with one another and any characteristics about the characters you may notice. Don't forget to include yourself as a character! Plot/Conflict: The events and actions within that dream that take place. Symbols: Parts of a dream that represent something deeper. Theme: What you believe the dream to be about - usually a 1-2 sentence that describes the storyline and meaning. Mood/Tone: Describes the emotion and feeling in the dream. Think of it like this: Was your dream a drama or a comedy? Where did the dream take place? What details do I remember about the setting of the dream? What characters/people were in the dream? What objects stand out to you that may be symbolic? What do you think the theme or summary of this dream is? How did the dream make you feel? What emotion did it convey? Answering these questions will improve your ability to identify and be aware of dream elements. This makes it easier for you to put the story together and understand the type of dream and how it may relate to waking life. Does thinking of dreams as a story or a movie help you understand what they might mean? Share your thoughts or ask any questions you might have in the comments section below!